An attempt at a Remington theme. Remington has been forged since the early 20th Century. His most famous forger was named Eugene Field, Jr., who copied in watercolor Remington illustrations from black and white books and magazines. He also made inscriptions in books, signing Frederic Remington's name. 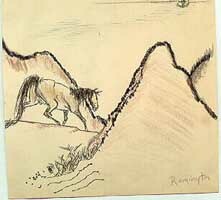 Field invented a "kicking horse" signature for his faux Remingtons. 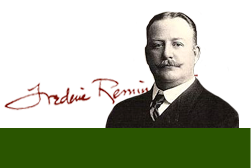 In each of Field's "Frederic Remington" signatures, he drew a horse leaping from the "F."
Since Remington's work was widely available in prints and illustrations as early as the 1880s, and was also highly valued and popular, there are many forged Remington oil paintings. Some are copies of prints in circulation, some are in Remington's style, but not copied from any particular work, and in some cases the only association they have is that Remington's name appears on their surface. There are fake Remington sketchbooks and drawings. These works are executed with a range of effectiveness, from the absurd to the highly plausible.